I’ve had several people ask about ideas for home programs to develop fine motor skills/handwriting, so I created a new program to meet this need. The program is based on the ideas that parents are often the best teachers for their children and that skills are learned best when done in small amounts throughout the week. The program I am offering includes my skilled services to assess strengths and weaknesses, followed with individualized, weekly home program kit, including instructions and supplies, designed to strengthen fine motor skills. The focus is both on showing parents how to improve skills in everyday activities at home, while also targeting skill development for the child. A weekly kit is delivery to you (within my service area), for convenience and easy of use. 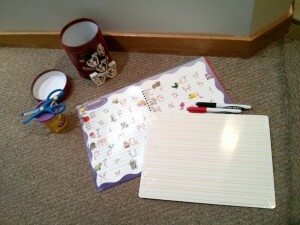 Step 1: Short assessment in your home of your child’s fine motor skill level. From this assessment, I will identify 2-4 areas that can be addressed by parents during home play activities. I will spend about 30 minutes with your child and 30 minutes with the parent explaining the skill areas to work on with your child. Step 2: Weekly home program kit delivered to your home. 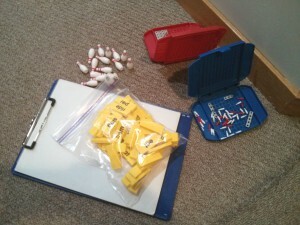 This kit will include at least 3 activities to target specific skills, supplies included. There may also be additional activity recommendations that most families have the supplies for at home already. Each activity will include an explanation of its goal and what skill it is teaching, as well as multiple examples of how to use the activity to teach and challenge your child. Step 3: Trade in your weekly kit for a new kit. Continue with weekly home programs for a minimum of 4 weeks, or for as long as you feel it is helping your child. $100 for the initial assessment, including in-person explanation for parents’ understanding. $150 for 4 weeks of individualized kits with supplies and instructions with home delivery. Materials to be returned each week, unless otherwise agreed upon. Additional services and consultation available, but at an extra charge for my time. 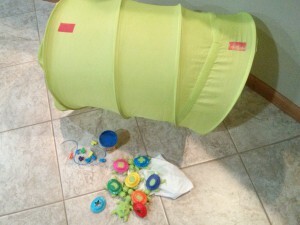 3 year old who avoids most fine motor play. Assessment showed decreased core and arm strength, decreased hand strength, and poor bilateral skills. Weekly home program kit includes activities that will build strength (crawling in tunnel, molding playdough) and promote use of both arms together (stringing beads, crawling, putting shells on turtles). 5 year old who can’t write his name or letters. Assessment showed immature grasping pattern with decreased dexterity and in-hand movements and poor dissociation of sides of hand for movement vs. stability when writing. Weekly home program kit includes activities that will improve control of fingers (stacking cow game), teach grasping patterns (cutting playdoh and write and erase tracing books). 4th grader with poor handwriting report from his teacher. Assessment showed poor attention to task and ability to monitor and self-correct work as well as inefficient hand skills for speed, accuracy, and efficiency in writing. Weekly home program kit includes activities that are motivating for fine motor skills development(mini bowling and mini battleship) as well as direct practice tasks focused on teaching quality work skills with analytical/evaluative thinking skills. The coordination of small motor movements in the arms and hands for functional tasks, such as finger-feeding, coloring, writing, zippers, and playing with small toys such as legos. This usually involves the use of vision in combination with motor movements (visual-motor integration). 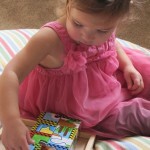 To learn more about typical fine motor development, see this blog post. What concerns do parents have? My child avoid all writing and coloring tasks. My child doesn’t hold her pencil right and doesn’t know how to write her name. My child is starting kindergarten and I worry she is behind her friends. My child’s teach complains she can’t read his school work. My child rushes through all his work and I can’t read it. My child can’t keep up with peers on school worksheets. My child complains her hand hurts when writing. What kind of supplies and activities will be included? You can expect activities selected specific for your child’s age, skill level, and interested. My focus is on finding fun ways to build skills that also show parents how everyday tasks can be used to develop fine motor skills. There is no specific recipe for each kit, other than it will include at least 3 activities with instructions and supplies (supplies range from new art supplies and workbooks to used board games and toys). Some supplies may be kept (such as an art project or a can of playdoh), but most will need to be returned. If an activity is really working and your child enjoys it, let me know and we can work something out to keep it longer or purchase for your own use.